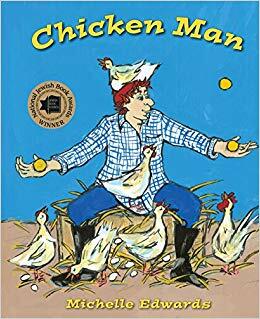 Deep in Israel’s Jezreel Valley there once lived a man known to his mother as Rody and to all the rest of Kibbutz Hanan as Chicken Man…Chicken man liked the chicken coop. He liked the chickens. He liked all the noisy clucking when he sang…Chicken Man thought that he might like to work in the chicken coop forever. Rody loves his job in the chicken coop, he loves the chickens as well. And the chickens? 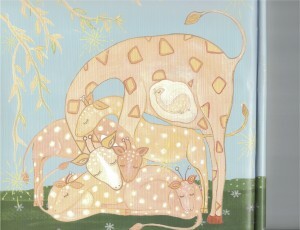 Well they love Rody in return – in fact when Rody took care of the chickens they laid more eggs than ever before. But there was a problem. Rody had a unique attitude toward his work and that attitude caused others to covet his position. You see Rody was a content and happy worker. He even sang as he worked. He made whatever job he was given seem easy and that caused Bracha – who spent long hours in front of a big hot stove – to request to be moved to the chicken coop. So Rody was moved to the laundry. It was hard for Rody to leave the chickens but he said goodbye and moved to the laundry. Singing as he worked, he once again made his job look easy. And soon Dov – who milked the cows – asked for Rody’s job. And so it goes on and Rody is moved from one position to another. This is truly a delightful read and without giving the entire story away – all ends well for both Rody and the chickens. Chicken Man teaches us that there is beauty and value in every job. This book is a sweet introduction for children to a valuable work ethic and an insight into the early years of life on the kibbutzim in Israel. Reading aloud – together as a family – has been something my husband, daughter, and I have always enjoyed. And this practice of reading together has become a tradition intricately woven into our celebrations. C.S. Lewis said, “No book is really worth reading at the age of ten which is not equally, and often far more, worth reading at the age of fifty and beyond.” I would push that number even further to the left as we have found that we never outgrow our favorites. Favorite books become family treasures and when we pull them out to enjoy, again and again, it is like welcoming back an old friend who brings into our midst warm and loving memories – memories which are heirlooms we pass down to our children. 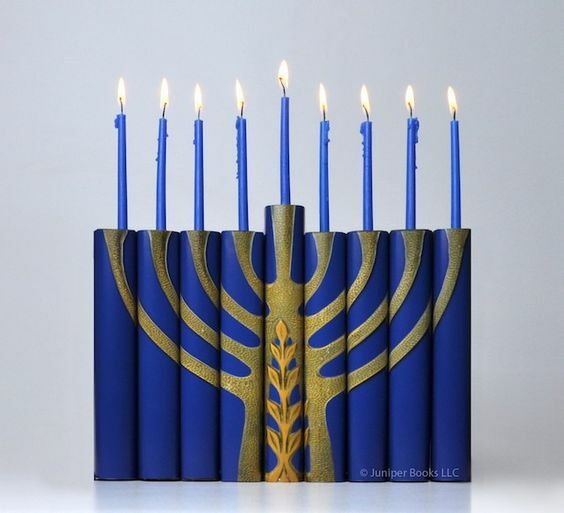 The following are just eight of so many wonderful Hanukkah reads available. 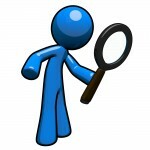 In past years I have done other reviews and I invite you to visit those posts. I love pop-up books and this book does not disappoint. Pop-up master, Robert Sabuda, and acclaimed poet, Michael J. Rosen, have created a work of art! 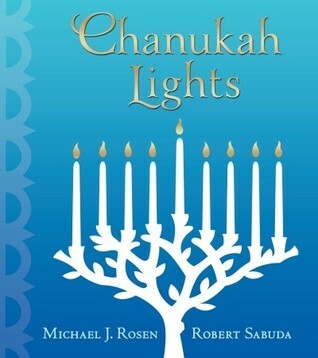 With eight pages, one for each night, you can follow the Festival of Lights through history. From Herod’s temple, through the heat of the desert, to a shtetl in Russia; from a refugee ship bound for the New World to an Israeli kibbutz, and on to skyscrapers… this book is a treasure! Definitely a book to be explored again and again. 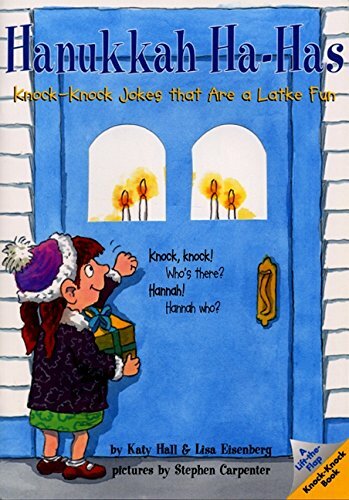 Filled with jokes, flaps to peek under, and two Honey-kah Mack-a-bees – oh how I would have loved to have found this book when my daughter was little! Sweet, innocent humor – I can just imagine the precious laughter as these jokes tickle the funny bone of young and old alike. 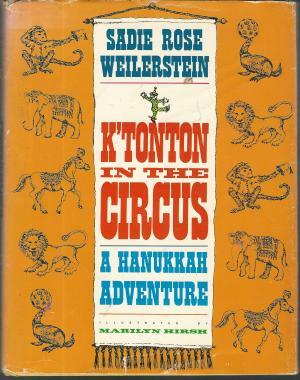 K’tonton is the Jewish Tom Thumb, raised on milk and honey (honey from Israel). 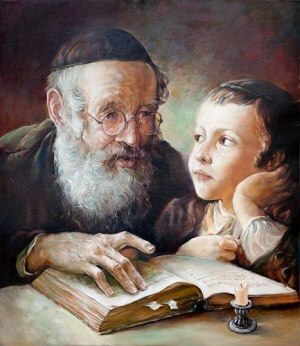 On the first day of Kislev, K’tonton is at synagogue with his father. His father, needing to talk to the rabbi, places K’tonton on the window sill to wait for him. K’tonton, thinking of Mashiach and singing “Elijah the Prophet come soon, soon”, is swept up by a tall bearded man on a white horse. Tucked into the mans sash, K’tonton thinks he is in the company of Elijah. A wonderful misadventure filled with old fashioned black and white illustrations. and the miracle that kept them aglow for eight nights. 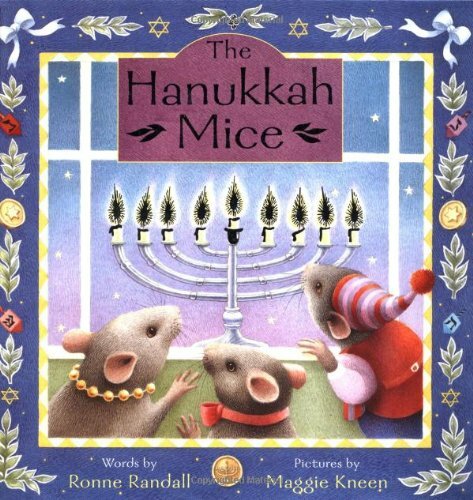 A sweet little Hanukkah read about a family of mice who on each night of Hanukkah find a sparkling, foiled, special treasure hidden behind a foldout on each page. 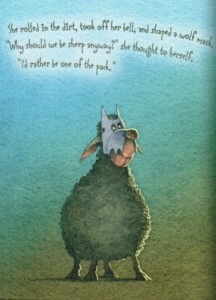 Both the verse and illustrations are gentle and precious. Oskar’s mother and father believed in the power of blessing. 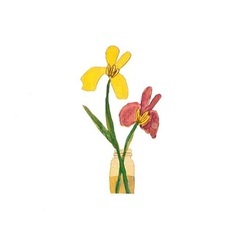 …until the Night of Broken Glass. 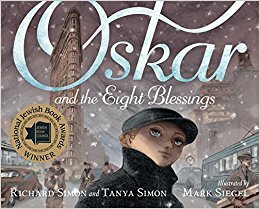 Arriving by ship as a refugee on the seventh day of Hanukkah, 1938, Oskar walks over a hundred blocks on Broadway, New York City, to reach his aunt’s home. Along the way Oskar meets kindness after kindness. Detailed, heartwarming illustrations combined with a simple and poignant story that had me wiping my eyes just to see the pages. This book delivers a beautiful message – one that is so very needed in our world today. 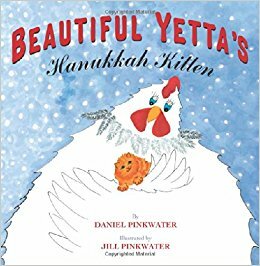 Beautiful Yiddish-speaking Yetta escaped from a poultry market and now lives with a flock of Spanish-speaking wild parrots of Brooklyn – to whom she is their Yiddish mama. One cold, snowy Hanukkah night Yetta hears a noise. It’s a cold, hungry, tiny kitten. Yetta and the parrots want to take care of the kitten, but they don’t know how. 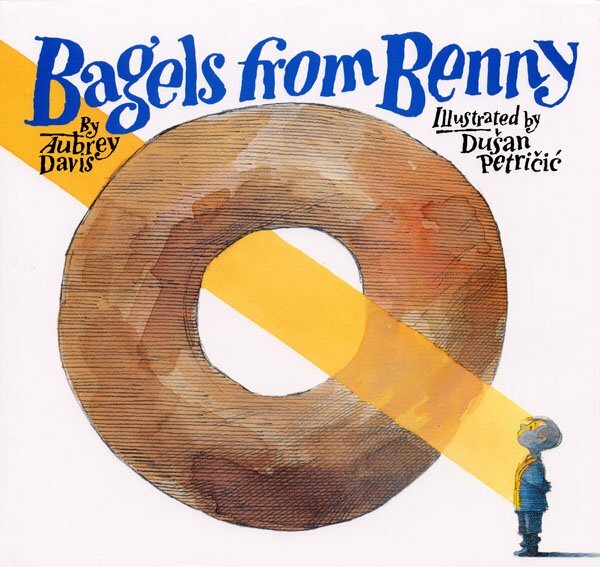 A very sweet, multilingual story (English, Yiddish, and Spanish – A translitera­tion of Yiddish and Spanish is included) with lively, brightly colored illustrations. Latke, an adorable newly adopted puppy, is rescued from the animal shelter on the first night of Hanukkah. Happy to join his new family in celebrating Hanukkah, Latke has a bit of trouble learning the house rules. 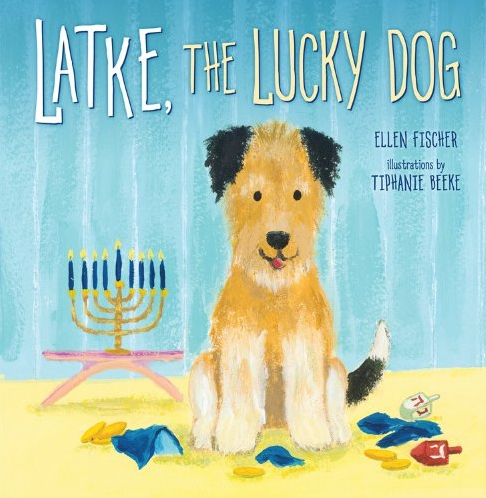 Latke, The Lucky Dog, with it’s soft colors and expressive illustrations is a sweet Hanukkah read with a message of gratitude and forgiveness. Old Bubba Brayna can’t hear or see very well, but o’vey she makes delicious latkes! 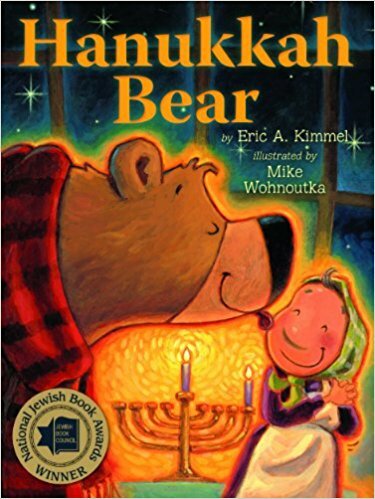 On the first night of Hanukkah, Bubba Brayna invites her rabbi for dinner, but an old hungry bear – who smells the wonderful aroma of her latkes – is drawn to her door first and Bubba Brayna invites him in, mistaking the bear for her rabbi. 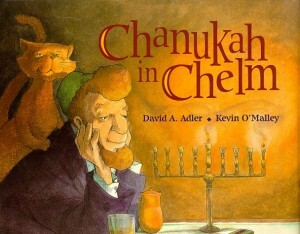 This is a cute re-telling of The Chanukkah Guest with warm and rich illustrations. Truly a Hanukkah delight! 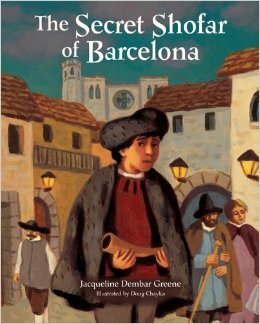 The Secret Shofar Of Barcelona takes place in Spain during the late 1400’s and early 1500’s. This was a time of intense Antisemitism and severe persecution of the Jews by the Roman Catholic Church. It is known historically as the Spanish Inquisition. Thousands of Jews were murdered. Further thousands managed to survive by fleeing to other lands. Still, large numbers remained in Spain and, to save their lives, converted to the Catholic faith. These converts were known as conversos – Jews living Catholic lives in public while practicing their true faith – as best they could – in private. These conversos not only had to hide their true faith from the Inquisition but were under constant surveillance and suspicion. Spies were everywhere and the secret Jews lived in constant fear of being discovered. From this period came a Sephardic legend about one very courageous converso, Don Fernando Aguilar and his son, Raphael. Don Fernando Aguilar was the conductor of the Royal Orchestra of Barcelona. On the eve of Rosh Hashanah, Don Fernando decided to secretly honor the Jewish New Year by presenting a concert that included the blowing of the shofar. Hiding in plain sight, his son Rafael blew the shofar – Tek’iah! Shevarim! Teru’ah! Tek’iah Gedolah! Hundreds of notes in all. The non-Jewish audience were fully appreciative of the performance and sound of this unfamiliar instrument. But to the Jews in the audience, the cry of the shofar meant that they could fulfill the mitzvah of hearing the shofar blown for the first time in years. Accompanied by rich, warm and opaque paintings, The Secret Shofar of Barcelona is a gentle way to introduce AntiSemitism and the period of the Inquisition to children. A mountain of blintzes to make us think of the mountain Moses climbed. Up and down he went, to bring us the Torah, the Laws. Shavuot is only two weeks away and Sarah is thinking about the mountain of blintzes she is hoping to make for her family. But, there is one problem – they have no spare money for the ingredients. Sarah and Max come up with a scheme for making the much needed extra money. With every good intention of daily putting their hard earned coins into a coin box, Shavuot draws near and the entire family gathers to open the coin box only to find there is not one coin inside! Set in the 1920’s in the Catskill Mountains A Mountain of Blintzes is a sweet story of a family pulling together. 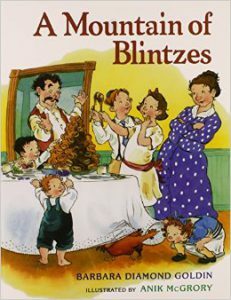 With truly delightful illustrations and a story with a touch of the tradition of Chelm, A Mountain of Blintzes is a Shavuot treat! Author Barbara Diamond has given HIS-ISRAEL permission to share her mother’s recipe for blintzes in our DIY Shavuot – take a look here. – assigns the roles, and controls everything. A fun, whimsical telling in the spirit of a traditional purimshpiel (Purim Play) that tells the story of Esther on multiple levels. Both the text and illustrations are touched with humor and so many details that will keep any age enjoying this read time and time again. A time to celebrate, with fun and laughter, the joy, light, and salvation to be found in our G-d! * Each source is noted at the back of the book. that the world could not exist without you. When I First Held You speaks a message which every child should have impressed on their heart from the time they are conceived – that they are not only cherished but celebrated. 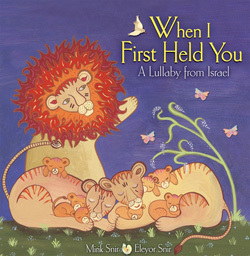 This sweet book with its simple words and caressing illustrations creates a lasting image of a message that the Sages of Israel have long taught – that each person created by G-d’s love is a world unto himself / herself with a uniqueness and a purpose of their own. A gentle book for the very young but with a message that should be repeated to every child at every age. * As translated in the book. I have read the following translation in other places and prefer the slight change of decided to declared and exist to preserved. Both these slight word changes more clearly express the essence of this lullaby. that the world could not be preserved without you. 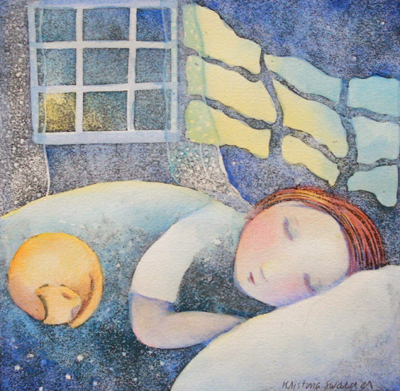 The world says stories are meant to help you sleep. As a homeschool mom I remember well that glazed look that would tell me I had lost the attention of my daughter. But when I would say, “Let me tell you a story” or “Lets read a story,” my daughter’s eyes would blink into focus. The power of a good story! 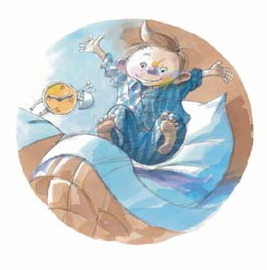 A good story should wake you up. We see that ‘waking up’ over and over again in the stories told by a master storyteller found in the Brit Chadashah, Yeshua. He knew well the art of clothing a message of truth in a story and engaging the hearts of His listeners. Though maybe not of that caliber, we do hope that our 2015 recommended Hanukkah reads will engage your hearts and minds. Hopefully you and yours will have precious moments of laughter, hugs to your hearts, inspiration, and even a few A-ha’s. So, gather your children and grands close and be prepared to be woken up. 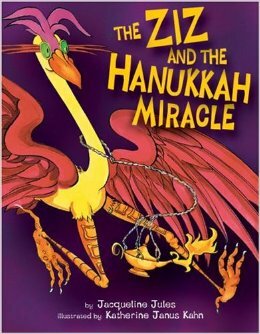 The Ziz – a giant bird from Jewish folklore – learns the truth of how sharing your light doesn’t cause your light to decrease but increases it’s intensity. This is a story of two men of faith. 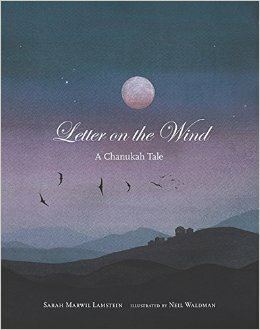 Hayim, a poor man who sends a letter ‘on the wind’ to G-d asking Him to send oil for his village. Drought has withered the olives and there is no oil for the Hanukkah lamps. 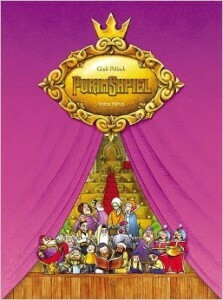 The second is of Ger Yehudah, a rich merchant who receives the letter as from G-d.
A beautiful retelling of a Middle East folktale about the mysterious workings of G-d.
A story of faith and charity illustrated with warm and moving watercolor illustrations. Oy’vey! What happens when Bubbe swallows a misplaced dreidel? A fun, frolicking read. If you are a art history buff you will throughly enjoy the illustrations which are parodies of classic works of art. Weaving in the customs and the story of Hanukkah, each day ends with the lighting of another Hanukkah candle. 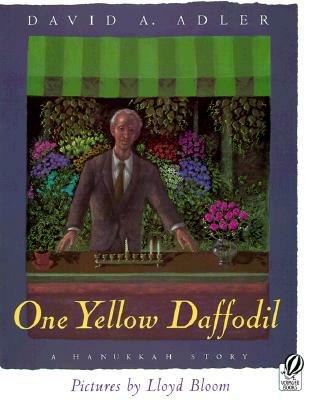 This gentle read is the story of Morris a Holocaust survivor who with the help of two children is able to once again celebrate Hanukkah and to remember. Author David Adler based this story on interviews he did with Holocaust survivors. Illustrator Lloyd Bloom does a remarkable job of conveying in each drawing the grief and loneliness of Morris but also the comfort and pleasure he finds in new friends. Both the words and illustrations will leave a lasting impression on your heart. A story from oral tradition, In The Month of Kislev tells the story of a rich lumber merchant who brings charges against three hungry children who he accuses of stealing the smells of his latkes. The towns kind and wise Rabbi teaches this rich merchant that there is more to Hanukkah than he thought. 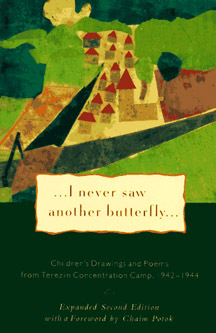 Illustrated with rich, vivid woodcut illustrations. A beautiful retelling of the Maccabees – illustrated with expressive watercolors. On the eve of Hanukkah Moses and Benjamin, two brothers, set out on the long dangerous journey to Israel to escape pogroms. Traveling by foot, train, and horse cart, they carry with them a old battered lamp and enough oil for one night. They keep up their spirits by telling the stories of the Maccabees and as they light the menorah they hope for another Hanukkah miracle. 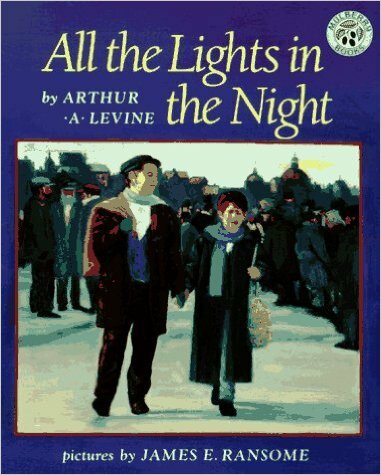 A story of brotherly love and enduring faith, All The Lights In The Night is based on the true story of how Mr. Levine’s own grandfather and great uncle escaped from the shtetl of Drahitchen in 1914. Over 500 years ago, the King and Queen of Spain decreed a harsh law on the Jews and expelled them from their homes. The Jews wandered from country to country and looked for another place to live. Some of the Jews got to Greece, and some to France. Some of them went to Morocco and others ended up in Turkey. Some even had their dreams come true and reached holy Eretz Yisrael! This heartwarming adaptation of a classic Jewish folktale – tells the story of Yaakovo and his wife Esperanza, two Spanish Jews who were among a group who reached Eretz Yisrael. Yaakovo and Esperanza were the simplest of Jews with a pure love and childlike faith in HaShem. Though they could daven (pray) in Hebrew, the only language they were able to speak or understand was Spanish. 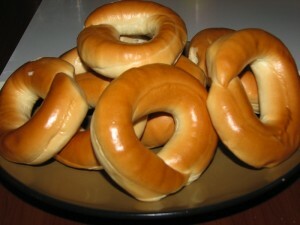 Yaakovo, not quite understanding everything the Rav had said, rushes home to tell his wife that she needs to bake twelve holy and tasty challos because Hashem loves to get special challos for Shabbat. So starts this precious and sweet story of the simple hearted Yaakovo and his dear wife Esperanza whose challos were the most delicious of any to be found. As with all of Gadi Pollacks books, his illustrations are so lifelike I find myself waiting to hear them speak or step off the page. 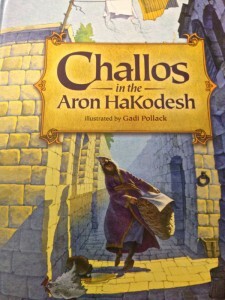 Challos In The Aron HaKodesh is a touching tale of a simple hearted love for G-d. 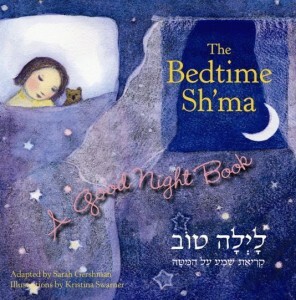 It has a lesson about emunah (faith) and kindness for all ages. 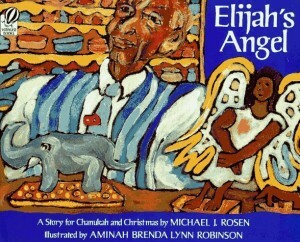 You can purchase this wonderful book from amazon.com – Challos in the Aron HaKodesh. As the flickering lights of Hanukkah invite us into their warmth and holiness, it feels like the most natural thing in the world to cuddle up with a good book together with those we love. Reading together has been part of my family’s celebrations for years and many of the reads I recommend have so many precious memories wrapped in them. 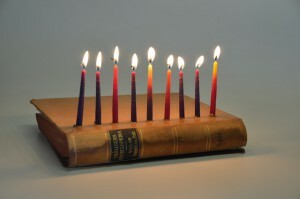 Thus it is with pure delight to share a a list of Hanukkah reads with a short review of each book. Between Keren and I, we have many more books to recommend than there are nights of Hanukkah. 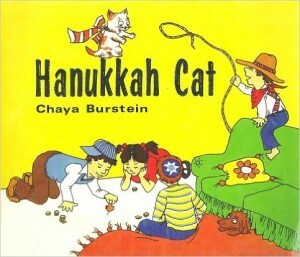 This list is merely a drop in the ocean of wonderful Hanukkah books available. A visual delight, Treasures of Chanukah does a beautiful job of “l’dor, v’dor” (The Hebrew sounds like opening the door to the next door and it translates, “from one generation to the next”). 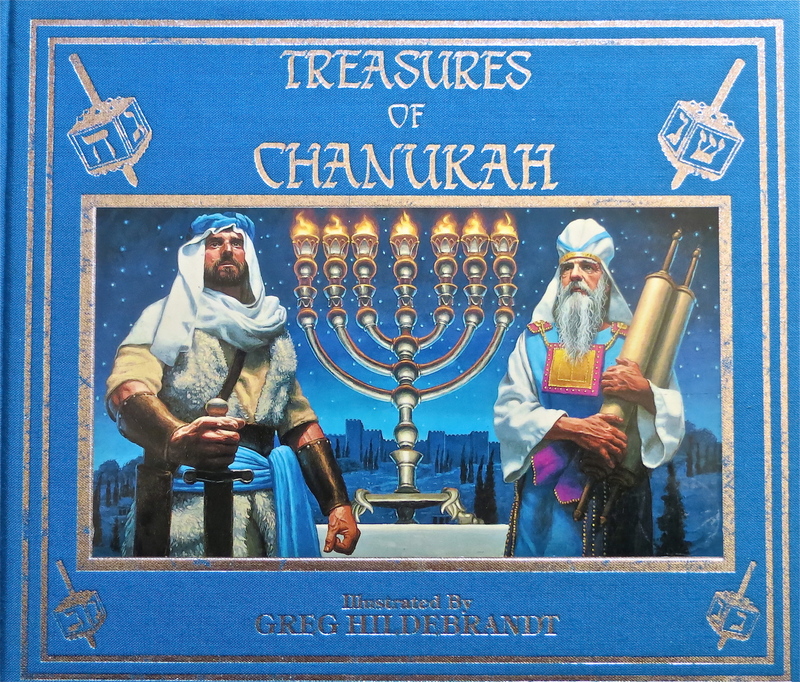 Treasures of Chanukah includes The Story of the Maccabees, and the rich illustrations pull you into the story as if you are there with the Hammer — Judah Maccabee — and his heroic freedom fighters, standing strong against the wicked Antiochus Epiphanes. 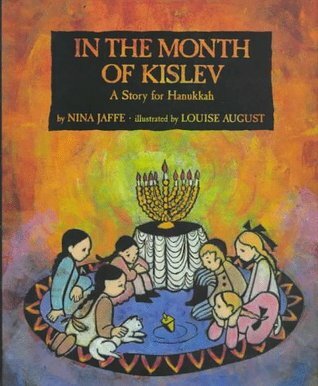 The middle section of this book (titled Festival of Lights) brings you into the home of a family who are about to share in lighting the Chanukah lights and to celebrate Chanukah with stories, food, and games. The last section of Treasures of Chanukah is full of wonderful Songs and Blessings. ***With or without a copy, follow along in the Books section as Keren shares the first two parts of Treasures of Chanukah. 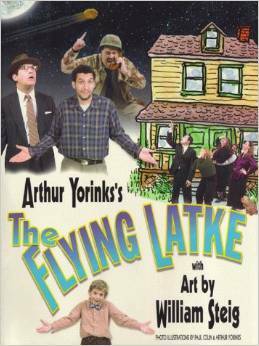 The Flying Latke is a slap-stick tale of a feuding family and the havoc that results from a food fight on one Hanukkah night. Uncle Izzy throws a latke out the window, and the FBI ends up thinking that the latke is a UFO. Soon the air force is called in to shoot it down. For eight days and nights, Danny Silverstein and his meshugge (crazy) family are trapped together and oi’vey! the plotzing (excitement)! The Flying Latke provides a good laugh, and if you are familiar with children’s books, you might recognize a couple of the players: Maurice Sendak (as Uncle Al) and Vladimir Radunsky (as Sol). 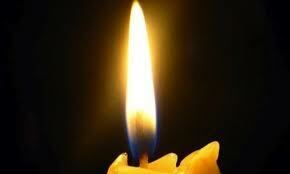 One Candle is told through the eyes of a young girl. 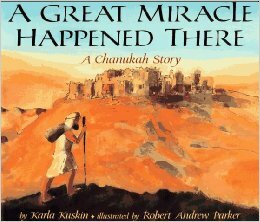 It is a Hanukkah story about remembering the past and celebrating the present. Every year on Hanukkah, Grandma hollows out a potato, adds some oil and a wick, and lights it. Then Grandma shares the story of when she and her sister, Rose, were in the Nazi concentration camp, Buchenwald. When it came time for the Festival of Lights, Grandma stole a potato, along with bits of margarine and a couple of matches. 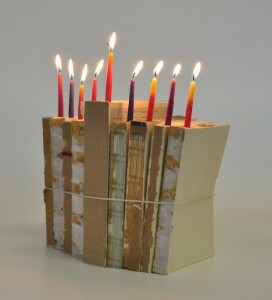 Using a thread from Rose’s skirt, they made a wick and set apart this special time with their one Hanukkah candle. That Hanukkah candle lifted us,” Grandma says, and there are tears in her eyes. “It lifted us to the stars. It happened long ago in a village far away, where there lived a little family named Menashe. 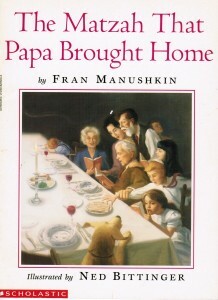 Papa and Mama Menashe were tailors who had two children, Rebecca and Ezra. Rebecca and Ezra were wonderful children who helped their mama and papa. Every year when it came time to celebrate Hanukkah, they dug up potatoes to make the latkes, and they picked the apples for applesauce. But one year, winter came suddenly and snow began to fall — not just a lazy flake or two or a little bit of a flurry. No! This was a tremendous blizzard — as if all heaven’s featherbeds had burst! 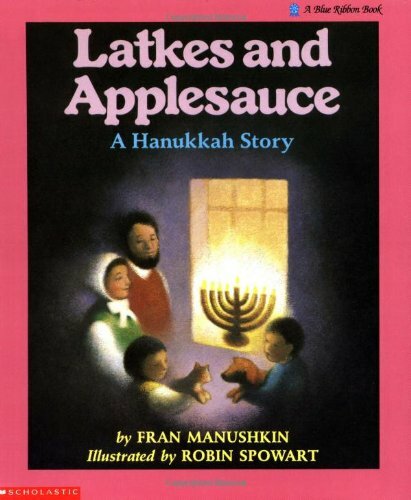 A family read since Roxanne was small, Latkes and Applesauce is a sweet, gentle story inspired by the rabbinic injunction that on Hanukkah, we must not mourn or fast. 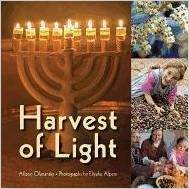 In Harvest of Light, follow an Israeli family as they grow, harvest, and process olives into oil — some of which is used in their lamps for the festival of Hanukkah. Illustrated with beautiful photographs and told through the narrative of a young girl, Harvest of Light is about a family living in The Land and working together. There are two Chelms. The first is a real town in Poland. 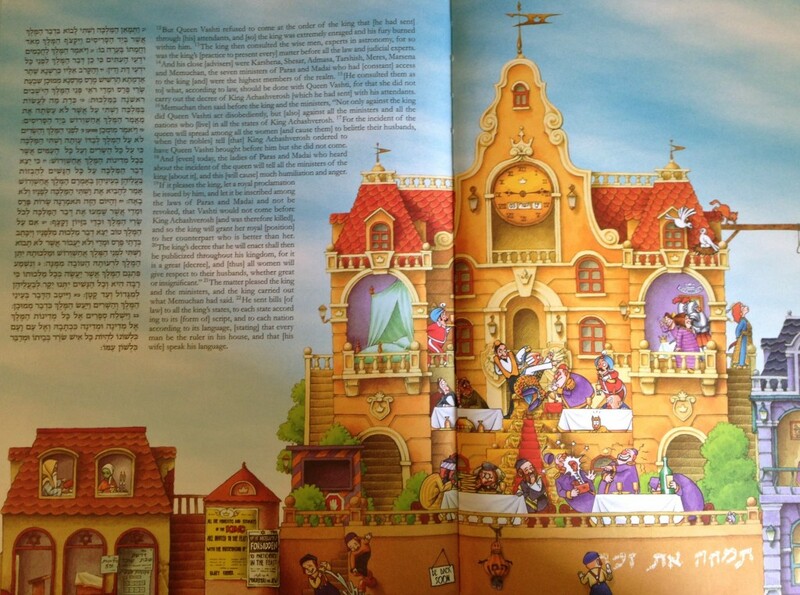 The second is a make-believe town in Jewish folklore, and is a place where people have big sweet hearts but very little sense. If you have never met the people in the folklore town of Chelm, Chanukah in Chelm is a wonderful first meeting. If you have met them, Chanukah in Chelm is a delightful revisit. David Adler tells a tall tale about Mendel, the synagogue caretaker, who needs a table to hold the menorah for the first night of Chanukah. 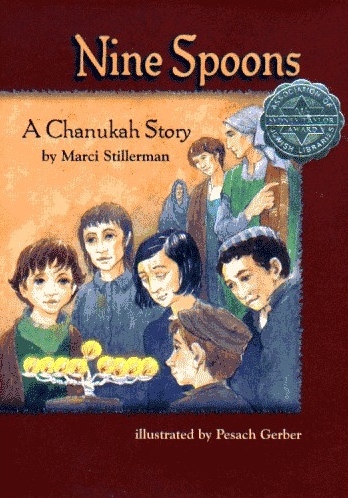 Full to the brim with good humor and warm candlelit illustrations, Chanukah in Chelm is a sweet, lovable portrait of the fictional inhabitants of Chelm. As the last night of Chanukah is drawing to a close, Oma gathers her grandchildren close and tells them the story of the strange, twisted menorah that burns bright in her window. 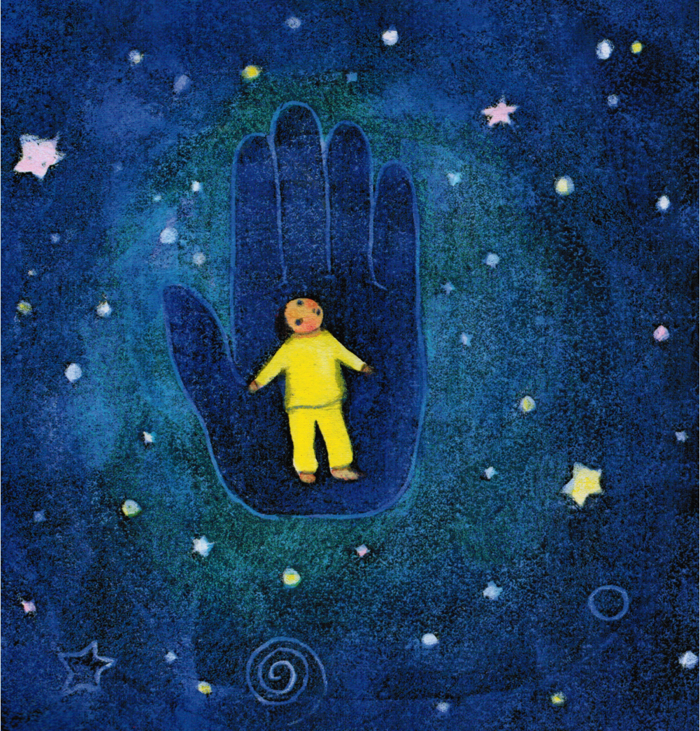 Winner of the Sydney Taylor Award of the Association of Jewish Libraries (1998), Nine Spoons is a precious story of mesirat nefesh (self-sacrifice for the performance of a mitzvah). It is based on a true event: when Oma and fellow women interns obtained spoons to make a menorah for Chanukah. Nine Spoons is well-researched and is illustrated with great sensitivity toward a very young audience — an audience to whom this may be their first exposure to the horrific events of the Shoah. Elijah’s Angel is told from the perspective of nine-year-old Michael, a young Jewish boy to whom Elijah gives a carved wooden angel. Deeply touched, young Michael is nonetheless concerned: is the carved angel a graven image? Eric Kimmel weaves an intriguing tale of two brothers. Ezra, the younger brother, was kind and generous. Ezra means ‘help’ and he lived up to his name. Eben, the elder brother, was rich and selfish. Eben means ‘stone’ and he lived up to his name, too! 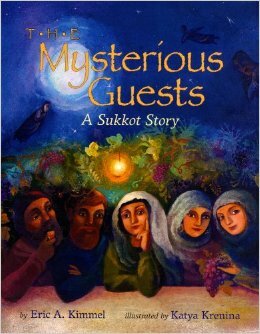 The Mysterious Guests is built around the tradition of inviting our forefathers Abraham, Isaac, and Jacob, among others, into our sukkahs each year. It is also built around the heart of the principle of hachnasat orchim (the welcoming of guests into one’s home, which is a fundamental Jewish value modeled by Abraham and Sarah in the book of Genesis). Just like Abraham and Sarah, we are called upon to warmly welcome guests and to provide for them with generosity and joy. 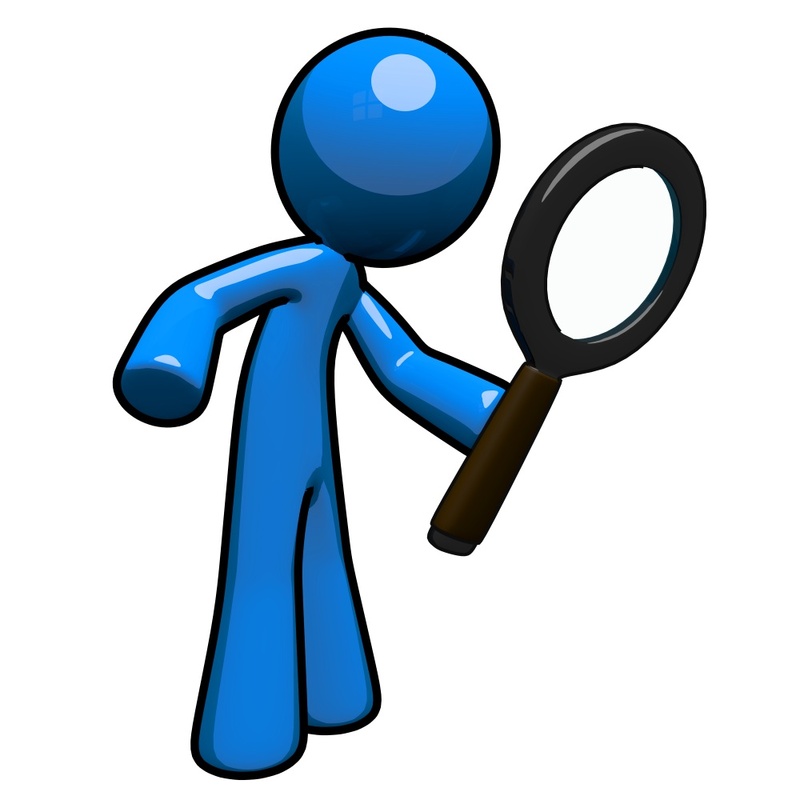 In The Mysterious Guests, we find three visitors looking for a few good menschen (people of integrity, openness, and honor). As these visitors come to each brother’s sukkah, they are welcomed in as ushpizin (guests). 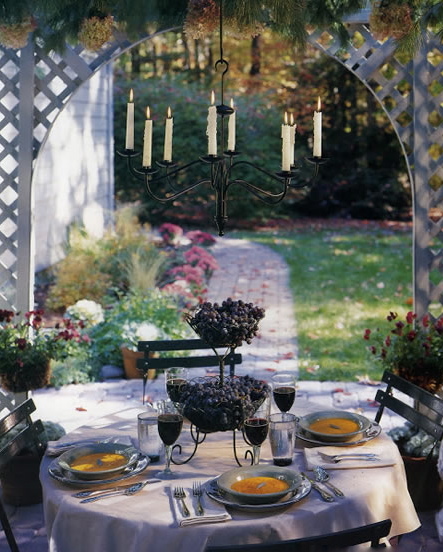 The two brothers’ hospitality toward their guests differs greatly, just like the appearance of each of their sukkahs. When taking their leave, the ushpizin bestow a blessing on the brothers which reflects not the beauty and richness of the brothers’ sukkahs, but rather the kindness and generosity – or lack thereof – in each brother’s heart. The Mysterious Guests emphasizes the truth that giving with a miserly heart not only diminishes the gift, but also the giver. However, giving with a joyful heart enriches both the recipient of the gift and the giver. This simple tale contains a beautiful message wrapped in the warmth of rich, autumn-toned illustrations. May our sukkahs and our lives be beautiful both inside and out! What happens when six adventure-seeking sheep–plus one reluctant and “wooly wart” sheep– decide to leave the protection of their shepherd and head out into the big, wide world? This treasure of a book has layers that illustrate lessons of ife to both children and adults alike. Within one layer, that of historical/political application, we can view this whimsical tale as a parody of the time the nation of Israel currently finds herself in (July/August 2014) –a time when the nations are pressuring Israel to make peace with darkness, in fact with an enemy motivated by hatred and evil intent. My fellow sheep, the wolves aren’t pursuing us for nothing. Something is obviously bothering them. Perhaps the problem lies with us. Let’s sit and talk things through with them, iron out our differences, and come to a settlement– which I’m sure they’ll be happy with. I am prepared to be our representative at the peace talks. You can imagine how well those ‘peace’ talks went since the last thing the wolves were interested in was peaceful, heart-to-heart dialogue. 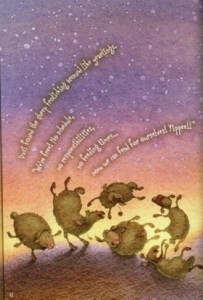 A Tale of Seven Sheep contains magnificent illustrations. 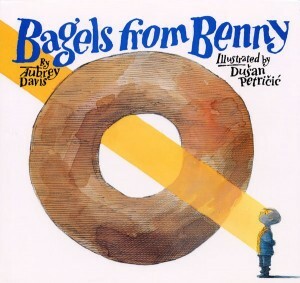 When my daughter was young, some of our favorite reads consisted of wordless books in which the wonderfully expressive illustrations alone told the story. 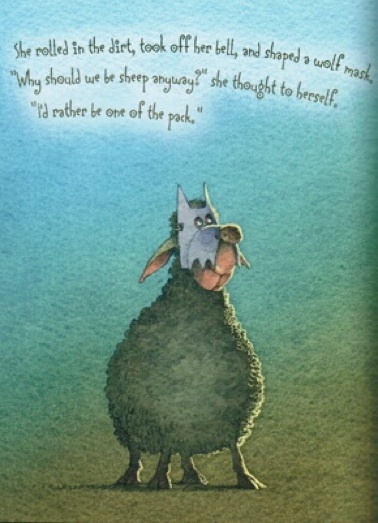 Even though A Tale of Seven Sheep has witty text and a thoughtful storyline, the illustrations speak so clearly that they themselves could tell the story without the aid of the text. However, the text only adds to the depth and humor of the story! Like the children who lived through the American tragedy of 9 -11, many in our (Keren and Cindy’s) age group grew up with a more organic exposure to the topic of the Holocaust. But as we Baby-boomers had children of our own, and our children have children of their own, the Holocaust moves further away. And the further away it moves, the more important it is to remember. The best remembering would be to talk to survivors and many have done so, to those who were willing to talk, and painful but precious memories have been recorded. However, as there are fewer and fewer survivors still living, we now need to find other ways. And peace and guardian care restore us. Prior to the Nazis take over in 1941, Terezin was a small Austrian town with about 7,000 residents. But between November of 1941-April 1945, Terezin housed more than 140,000 European Jews. The Terezin (Theresienstadt) ghetto differed from all other ghettos as it was designed to deceive the outside world. In April of 1944, the Red Cross visited Terezin. To prepare for their visit the Nazis beautified the camp with roses, fresh paint (on buildings that lined the route the visitors would take), a playground, coffee shop… and 7, 500 sick and dying were shipped off to Auschwitz. Many of those shipped were orphaned children. 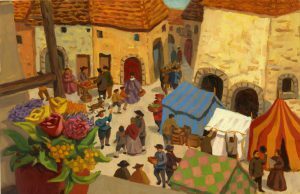 Terezin also differed as it was composed of European artists, musicians, and writers. One of those internees was artist Friedl Dicker-Brandeis. Friedl was a trained designer, artist, and teacher. At Terezin she organized art lessons encouraging the children to express their feelings in their work. 1. 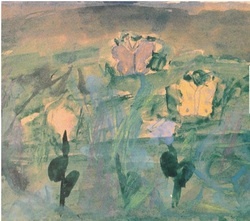 Ivo Leo Katz (April 11, 1932-July 1944) started out as a good-natured, cheerful, eleven-year-old boy. But the terrible conditions at Terezin made him angry and violent. When he drew with Friedl, he circled every shape with heavy black lines. Pavel was born on January 7, 1921, in Prague and deported to Terezin on April 26, 1943. He died in Auschwitz on September 29, 1944. Of the 15,000 children who passed through Terezin, only 100 survived. But these children left a legacy, a testimony to their lives and spirits. Friedl Dicker-Brandeis, before being shipped to Auschwitz, buried 4500 of pieces of work in two suitcases. Others were found hidden in mattresses and stuffed in cracks between the walls. Many of these drawings were used as clues during the Nuremberg Trials. 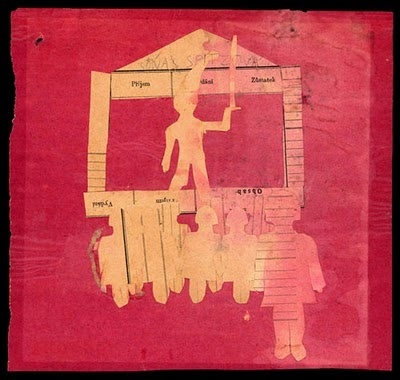 This collection allows us to see what life was like in Terezin, through the eyes of children. A heart rending look at the misery, sadness, and fear of these innocents as well as their courage, their hopes, and their fears. February 15, 1942. He died on October 19, 1944 at Auschwitz. Marika was born on April 19, 1933, and deported to Terezin on August 3, 1942. She perished in Auschwitz in 1944. Erika was born in Prague on October 28, 1934, and was deported to Terezin on December 17, 1941. She died at Auschwitz on October 16, 1944.
with the matzah that Papa brought home. Illustrator Ned Bittinger does a beautiful job of capturing life and all the warmth and fun of this family celebration.